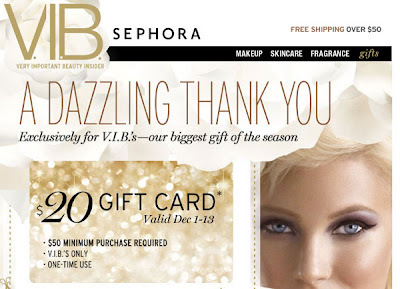 Simply Beautiful: Sephora VIB & BI Gift Cards!! Sephora VIB & BI Gift Cards!! So if you love Sephora, I'm guessing you are either a Beauty Insider or a Very Important Beauty Insider! After spending soo much already on during the annual Friends & Family sale, I was already looking to spend some more. I do wait for this gift card to come along, cause it gives me another incentive to SHOP!! YAY!!. So again, if you are a VIB and a BI, then you should be getting an email and a card coming your way if not already. I just got mines yesterday. Sephora is gifting a $15 Gift Card with a minimum purchase of $50 (which is alot, but not soo hard to reach either). Valid thru Dec 2-13th. So what are you buying with Gift Card? I'll probably get some skincare products or makeup palettes that I've been lemming.